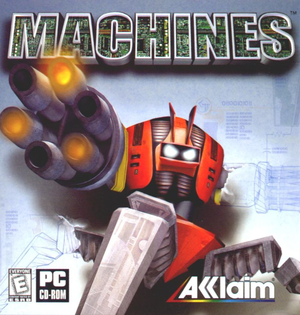 This game is also known as Machines: Wired for War. WiredForWar forums (old) - fan community. WiredForWar forums (new) - fan community. Latest patch v1.15 and a Windows 2000/XP fix can be downloaded here under Play (click letter H) - Downloads. With dgVoodoo 2 the game is rendered in 32 bit color depth and can be used to force anti-aliasing and anisotropic filtering. This can cause unstable framerate. Download the latest version of dgVoodoo 2 and extract it (verified working on version 2.54). Copy all the files from the MS folder and paste the files into the game installation folder. Optional: Run dgVoodooCpl.exe and configure the settings to you liking. Game uses DirectX, so the above mentioned improvements should be activated in the DirectX tab. Menus remain 640x480. 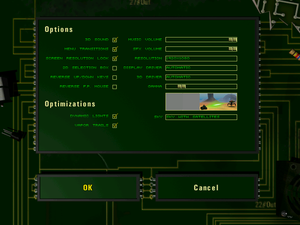 "Screen Resolution Lock" option determines whether menus are output as fullscreen 640x480, or centered with black borders at the selected resolution. dgVoodoo 2 can be used to remove DirectX resolution limit (2048x2048), but the interface doesn't scale with resolution and is very small. On by default, but not applied on all surfaces. Force using dgVoodoo 2 for best results. dgVoodoo 2 can be used to force MSAA, but it causes artifacts on letters and GUI elements. On by default during gameplay. Can be forced using dgVoodoo 2 to enable it in the menus too. No frame rate or refresh rate cap. High FPS results in low horizontal mouse sensitivity in first-person mode and faster menu transition animations. There are music and SFX volume sliders in the options menu, but they both change the master volume. Game can occasionally crash during gameplay even when Windows XP fix has been applied. Often saving is recommended to prevent loss of progress. Different types of selection boxes may not render on some graphics cards. In the options menu check or uncheck 2D Selection Box to render a 2D or 3D selection box. During gameplay 3D objects are rendered without textures. In the options menu check Screen Resolution Lock. A video memory setting limits the amount of memory available to store textures. Open the <path-to-game>\vidcard.cap file with Notepad. Add 0 at the end of each of the two numbers to increase their values. ↑ Information taken from the game manual and readme file. This page was last edited on 25 November 2018, at 18:53.